Today is the absolute final, no-going-back, end of Halloween on NbF! But there are PLENTY of freebies to grab, so fill your coffee/tea cup and grab you mouse. Before I start, I have to plea guilty to charges not yet filed... I made a boo-boo (isn't Halloween the perfect time for that?). A lot of you have commented on the picture of the candy cat I posted on Halloween and asked where I got it from. Well, I downloaded it from Facebook. BUT.... I have now discovered, that the picture is actually owned by Jadjdj and originates from Flickr ( http://www.flickr.com/photos/7495438@N08/7982595791/ ) with "All rights reserved". Oh, oh.... I do apologize if I have done anything wrong. But at least Jadjdj's picture was viewed and loved. That must count for something in my defence, right. 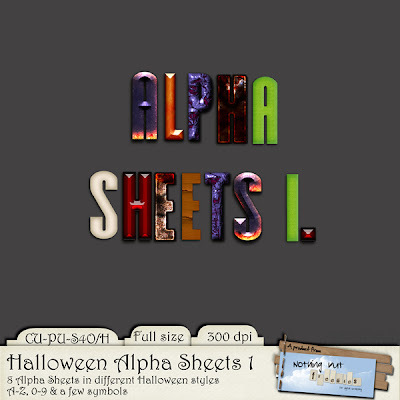 This final Halloween post brings you no less than 5 freebies including everything - papers, alphas, elements and backgrounds. First up is the alphas. They are "only" alpha sheets, as I did not have time for separating them. My apologies to those of you who haven't got the SW to do it yourself. As usual: Click images for direct download (4shared) or use alternative links below the images. First Alpha Pack is separated into 2 zips so be sure to get them both - no link from image! 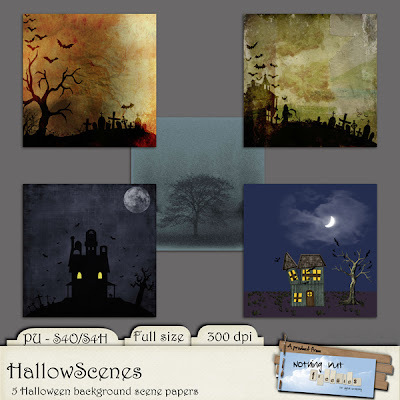 And then we have a pack of Halloween Scenes, or HallowScenes as I have called them. And finally, the "left overs". 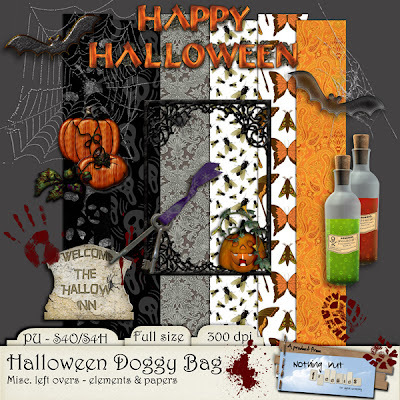 As always with my big themes, you get a Doggy Bag with everything not used in the kits and packs. I hope you can find some use for it. 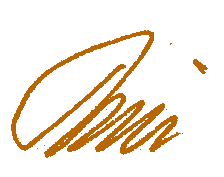 Please let me know if I have messed up the links - they are not easy to manage. That was that. Halloween closes and will not return for another 10-11 months. I hope you have enjoyed the ride and look forward to seeing you again soon for something totally different. Well, you didn't dissappoint us. Your finale is fantastic. Thank you for sharing the brilliant freebies. Wow! these are all fantastic! Love them all! thank you so much! Thanks so much for the last of the great hallowe'en freebies. 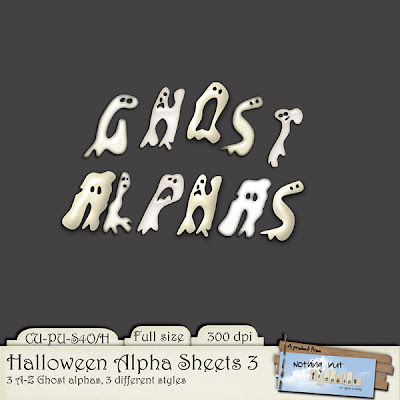 thank you so much for this ghost alpha...really cut! !